Pumpkin turned seven on Saturday. 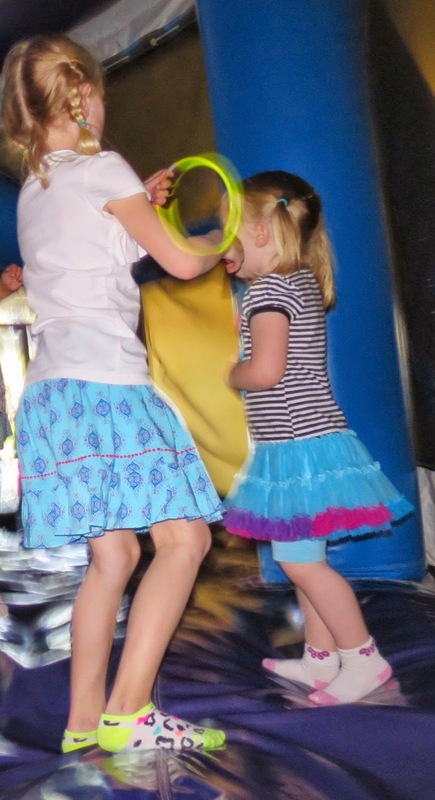 We had a nice, small family celebration on Saturday, and then a party at an indoor jumpy place with her friends on Sunday. The party with her friends included five of her friends from school and four of her friends from day care, plus a couple of Petunia's friends because the party price was a flat rate up to 25 kids so why not. Also, it kept Petunia from bothering Pumpkin at her party. It is always a bit breathtaking to see the former day care buddies together- I remember three of those four from the baby room, and the fourth joined when she turned two. They are so big now, but I can still see the babies that they were. I struggle to believe that these kids are really seven. Pumpkin is amazing me in so many ways these days. She works hard at gymnastics and has gotten quite strong, and overcome earlier fears about the high bars and the climbing rope. Her gymnastics gym has closed due to a zoning dispute- I am working on finding a new one, and quickly. She says she doesn't want to lose the strength she's built up. She is fluent in Spanish now, with such a large vocabulary and strong reading skills that her teacher lobbied the principal and got a special dispensation for Pumpkin to visit a second grade classroom for reading. They don't usually start grade-swapping until third grade, I think. Pumpkin's teacher said that she is so far ahead of her classmates that she was unconsciously intimidating them, so it is better for everyone to have her visit the second grade classroom. We're a bit nervous about what the future holds for us, as it is becoming increasingly clear that Pumpkin is really quite academically gifted. We're encouraged that the school is willing to try things to help her stay challenged, but we are also thinking about what else we might do. We don't really care if she is pushed as far as possible as quickly as possible academically, as long as she is still learning things at school and is not bored. But we also don't want to waste her capacity to learn, not because we want her to get "ahead" (whatever that might mean) but because she loves to learn. Honestly, so do I. I get that knowledge is power and all of that- but knowledge is also fun and I want to indulge that. So we're doing more science things at home, and are expanding Pumpkin's computer use. The computer thing wasn't completely on purpose- we accidentally left the USB network dongle in after a software update, and she discovered that she could open a browser and search for things. I only found out because she told me about how she looked up what her little sister's name means. I guess she'd been paying attention when we Googled things for her. Then, a couple of days later, she figured out how to check the weather forecast for herself. I guess she'd been paying attention when we checked the temperature for the day, too. So we checked that parental controls were on, and we've left the internet active. We'll see how that goes. So far, she's mostly gone to Nick Jr's website to play games. I'm OK with that. Perhaps after a few months playing games, she'll be interested in trying out some of the computer languages geared at kids to make her own games. I think it helps to use a computer for awhile to see what it can do before you try to program it. Perhaps my opinion on that is skewed by my own childhood experience, though- I received a hand-me-down computer when I was in the eighth grade. I wrote a program to make it play "Ode to Joy" and then lost interest in it, because I didn't really know what else to do with it. Speaking of music... we're also thinking about starting music lessons, but we haven't figured out the logistics of that yet. Between that and the fact that our summer commute is looking rough, it may be time to get a sitter instead of just relying on the YMCA program. The sitter could help with the after work crunch time and also perhaps be present for music lessons. We are fortunate enough to have the money to spend to make things easier, but we still have to find the time to figure out how to spend it, and that is not trivial. But I was supposed to be writing about Pumpkin. She is still shy about speaking Spanish in front of us, but we saw her use it on our recent trip to Catalina. We were all out for Mexican food, and Mr. Snarky found himself missing a place setting. He flagged down the waiter and asked for some cutlery, but between his accent, his tendency to speak without moving his lips (also a Kiwi trait, I think), and perhaps his unusual (for America) word choice, the waiter was flummoxed. Someone else quickly supplied that he wanted silverware, but I heard Pumpkin supply that, too... in Spanish. She wasn't tentative or unsure, just quieter than the adults, so her offering was missed. I look forward to hearing Pumpkin use her Spanish more in the future, as she gets more confident in her speaking abilities. I suspect that she'll be quick to use it when she thinks it will help. She loves to help- almost to a fault. At her recent "end of session" cheer performance, she was very concerned to help the other kids get into their correct positions. She truly just wants to help, but I confess that I cringed a bit at that. Luckily, that didn't last long, and I beamed with pride watching her do her jumps and kicks. At her birthday party, she requested that her school friends sing her Happy Birthday in Spanish after we all sang in English. They agreed, and those girls belted out the song without hesitation. It was awesome. But my favorite thing from this weekend was this: after the party, we came home to open gifts. Pumpkin liked everything she received- but she was particularly excited to open a toy horse. Petunia was very excited by that gift, too. Pumpkin held it close for a minute or so, and then she told us to get it out of its packaging so that Petunia could play with it. She is a wonderful big sister, and a wonderful kid. I'm looking forward to seeing what this year holds. So often I only hear about the hard parts of parenting, and with my own crap experience subbing in for my parents when my older sibling was out of hand, that I forget that it can be rewarding. Happy birthday to Pumpkin! Yes- very rewarding. Sometimes. And more than a little awe-inspiring. I remember learning molecular biology in college and just being blown away by how amazing life is- how improbable that it would come to be, and how amazing that our bodies function as well as they do. Becoming a parent took that feeling to another level. Watching a child grow and develop is just unbelievable sometimes. happy birthday to Pumpkin, and many good wishes to you all as a family! I thought I wrote a comment already, but probably forgot to press a button on the Ipad. That's great about the teacher being so flexible with grade-swapping. It really makes a difference. I think a lot of people don't understand just how miserable it can be for a gifted kid to be forced to not learn things, and how joyful in contrast it can be to learn new things. One day she'll be like my aunts and will get that balance between being a boss and micro-managing down. She's only 7-- she's got time before it starts affecting her bonuses. Oh, that's a good point about the balance between being the boss and micro-managing. I know grown ups who struggle with it! Thanks for reminding me. I just got self-conscious in front of the other parents, like they'd be judging her (and me) for it... but as you say- this is something we all have to learn and she's just a kid! Of course she's still working on it. I love the way you talk about Pumpkin's academic gifts and education. I love it. It's refreshing. She is so lucky to have parents who are both engaged AND laid back. Thanks! I always that these posts are too braggy- but then I figure that if I can't brag about my kid on a pseudonymous blog, where can I do it? Why not brag? It's all true, after all. She sounds like an awesome kid. Happy birthday, Pumpkin! And I completely agree with your comment that knowledge is fun. I think that is what makes me happiest about the preschool Moo is at the moment - they've made her introduction to learning so much fun. My mother was a (former) teacher who believed passionately in public schools--and that school was not the only place to learn. So we had innumerable after-school activities, trips and theater visits (some of which took us out of school), history-themed summer vacations, and more. I sometimes say that, as a result, I was both public-schooled and home-schooled. I want to do as much of this as I can for Baguette--but I also realize that as a stay-at-home mom, my mother had a very different schedule from mine. Finding that balance--the one that lets our children succeed in their unique ways, providing them support and motivation without wearing them down--it's tricky. But it sounds like Pumpkin loves learning, and that's the biggest piece of that puzzle. As someone who skipped a grade early on, I had some challenges--but overall, it did me far more good than harm. My Mom was also teacher, so we had summers at home, and I remember a lot of reading- but also my Mom teaching me to sew and doing fun things with us. And we took family vacations that included a lot of history (that was my Dad's doing- he loves to plan a trip, something I inherited from him). So I was a bit worried about what Pumpkin's summers would be like. But we have been super impressed with the summer camp options that the Y offers- each camp is one week long, so you can build up a nice mix of learning and play. Last year she had a camp that taught her about space, this year she's signed up for one that will teach her about dinosaurs. There are photography camps and cooking camps and other cool things as she gets older, too. We'll have to check out the Y--right now Baguette's day care has summer camp, so we haven't had to research options. I think they only go up through age 8, though. Aw, happy 7th birthday to Pumpkin!